An uncommon 1834 edition of the Society for the Diffusion of Useful Knowledge or S.D.U.K. 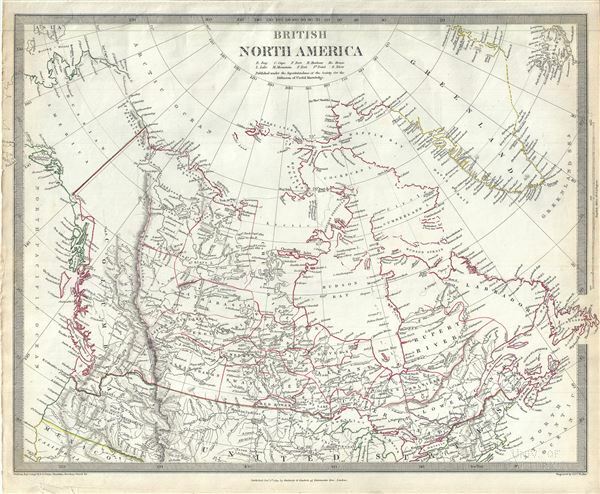 map of British North America or Canada. It depicts the British and Russian holdings in North America. Centered on the Hudson Bay, the map covers from modern day Alaska (Russian America) to Greenland and from the Arctic south to the U.S. border. According to the earliest written accounts, the Russians were the first Europeans who reached Alaska and eventually became permanent settlers. The modern Canadian provinces and territories were under British and French control from the 16th century, until France gave up its claims in the Treaty of Paris in 1763. Canada would remain a collection of British colonies until its confederation in 1867, when the British colonies of Ontario, Quebec, New Brunswick and Nova Scotia would become Canadian provinces. The map offers several elements of considerable cartographic interest. The border between the United States and Canada in the Pacific Northwest is set firmly at the Columbia River - recognizing, British claims. In the first half of the 19th century the Pacific Northwest was the last frontier in the century's long slaughter of the American beaver in the name of European fashion. Both the British, in the name of the Hudson Bay Company, and the Americans, championed by John Jacob Astor's Pacific Fur Company, were eager to claim monopolistic right over the region. Astor's establishment of Fort Astoria on the Columbia River only served to further tensions with the Northwest Company - the Pacific subsidiary of the Hudson Bay Company. The dispute escalated, giving rise to the Oregon Boundary Dispute and the American expansionist slogan 'Fifty-four Forty or Fight!' The dispute was not resolved until the 1846 Oregon Treaty which, through concessions on both sides, formally set the boundary at the 49th parallel. This map is particularly interesting as it is one of the earliest maps to accurately depict the Northwest Passage, predating the Robert McClure expedition by more than 15 years. The map correctly shows what are today called the Northwestern Passages between Baffin Bay and the Arctic Ocean. The mapping extends as far west as Melville Island and Banks Island, though does not include Prince Patrick Island. Even so, beyond Melville and Banks Islands, there is little but ice and seasonally open sea as far as Alaska and the Bearing Straits. This map was originally published by Baldwin and Cradock and is copyrighted in 1834, but was issued in Volume two of Chapman and Hall's 1844 edition of Maps of the Society for the Diffusion of Useful Knowledge. It was engraved by John Walker of J. and C. Walker. The "Society for the Diffusion of Useful Knowledge" was a Whiggish organization founded in 1828 at the instigation of idealistic British lord Henry Peter Brougham. The admirable goal of the Society was to distribute useful information via a series of publications to the English working and middle classes. It promoted self-education and the egalitarian sharing of all knowledge. While closely tied to the London University and publishing houses on the order of Baldwin and Cradock, Chapman and Hall, and Charles Knight, the Society failed to achieve its many lofty goals in finally closed its doors in 1848. Most likely the failure of the Society resulted from its publications being too expensive for its intended lower to middle class markets and yet not large and fine enough to appeal to the aristocratic market. Nonetheless, it did manage to publish several extraordinary atlases of impressive detail and sophistication. Their most prominent atlas consisted of some 200 separately issued maps initially published by Baldwin and Cradock and sold by subscription from 1829 to 1844. Afterwards, the Society combined the maps into a single world atlas published under the Chapman and Hall imprint. In its day, this atlas was unprecedented in its quality, scope, and cost effectiveness. Today Society, or S.D.U.K. as it is commonly known, maps are among the most impressive examples of mid-19th century English mass market cartographic publishing available. The S.D.U.K. is especially known for its beautiful and accurately detailed city plans. Chapman and Hall (fl. 1830 - present) was a British publishing house in London, founded in 1830 by Edward Chapman and William Hall. Upon Hall's death in 1847, Chapman's cousin Frederic Chapman became partner in the company, of which he became sole manager upon the retirement of Edward Chapman in 1864. In 1868 author Anthony Trollope bought a third of the company for his son, Henry Merivale Trollope. From 1902 to 1930 the company's managing director was Arthur Waugh. In the 1930s the company merged with Methuen, a merger which, in 1955 participated in forming the Associated Book Publishers. The latter was acquired by The Thomson Corporation in 1987. Chapman and Hall was sold again in 1998 as part of Thomson Scientific and Professional to Wolters Kluwer, who sold on its well-regarded mathematics and statistics list to CRC Press. Today the name of Chapman and Hall/CRC is used as an imprint for science and technology books by Taylor and Francis, part of the Informa group since 2004. The company is best known for its publication of the works of Charles Dickens (from 1840 until 1844 and again from 1858 until 1870), William Thackeray, Elizabeth Barrett Browning, Eadweard Muybridge and Evelyn Waugh. They continued to publish hitherto unpublished Dickens material well into the 20th century. In cartographic circles they are known as the primary publishers of the Society for the Diffusion of Useful Knowledge Atlas, a massive 200+ map atlas that was popular in England during the mid-19th century. John Walker (1787 - April 19, 1873) was a British mapseller, engraver, lithographer, hydrographer, geographer, draughtsman and publisher active in London during the 19th century. Walker published both nautical charts and geographical maps. His nautical work is particular distinguished as he was an official hydrographer for the British East India Company, a position, incidentally, also held by his father of the same name. Walker's maps mostly published after 1827, were primarily produced in partnership with his brother Charles Walker under the imprint J. and C. Walker. Among their joint projects are more than 200 maps for the influential Society for the Diffusion of Useful Knowledge Atlas (SDUK). In addition they published numerous charts for James Horsburgh and the British Admiralty Hydrographic Office, including Belcher's important map of Hong Kong and Carless' exploratory map of Karachi. The J. and C. Walker firm continued to publish after both Walkers died in the 1870s. Maps of the Society for the Diffusion of Useful Knowledge, (London: Chapman and Hall) The Society for the Diffusion of Useful Knowledge (S.D.U.K.) Atlas was initially issued in parts over several years by Baldwin and Craddock to promote the society's mission of egalitarian self-education. The first S.D.U.K. began appearing in 1829 when the society contracted John Walker to produce the first proofs. The first S.D.U.K maps were produced serially by Baldwin and Craddock and issued in 2 map batches, priced at 2 shillings each. The series, originally anticipated to feature 50 maps, ultimately contained 200 and took over 14 years to produce. The initial production was completed in 1844 when the whole was issued in its first compiled atlas edition. Around 1842, following the 1837 bankruptcy of Baldwin and Craddock, publication of the atlas was taken over by the Society itself, who issued editions in 1838, 1839, 1840, 1841, and 1842. Overburdened by the work of publishing, they then outsourced the publication to Chapman and Hall in 1842. Chapman and Hall produced editions in 1842, 1843, and 1844. Dissatisfied with the quality of Chapman and Hall printing, the Society turned to another publisher, Charles Knight, who issued editions under the auspices of the Society in 1844, 1845, and 1846. In 1846 Knight officially acquired the plates in his own right and reissued in revised editions until 1852, when he sold them to George Cox. Cox in turn sold them to Edward Stanford who published them from 1856 well into the 1860s. The S.D.U.K. Atlas is known for the quantity and quality of its maps. The S.D.U.K. published many maps of areas largely ignored by other publishers. The many city plans incorporated into the atlas are particularly admired and are the highlight of the S.D.U.K. 's long map publishing history. As a whole the S.D.U.K. Atlas was groundbreaking in terms of quality, scope, and being offer at a cost effective price point. Very good. Bears University of California Library Stamp, from which it was deaccessioned, in lower right quadrant. Minor creasing, lower left quadrant. Blank on verso. Rumsey 0890.126. Phillips (Atlases) 794.